Arizona Right to Life, Inc. A non-sectarian, non-partisan, non-profit, 501(c)4 organization, Arizona Right to Life is committed to articulating and protecting the right to life of all human beings, born and unborn. This is accomplished by educating people on the value of every human life and by promoting and supporting pro-life legislation, public policy and elected officials. Arizona Right to Life is the oldest, largest and strongest pro-life organization in the State of Arizona. Priests for Life focuses on abortion as their specific practical concern, but you will also find information on euthanasia, the other key area of our focus, and on related topics such as capital punishment and contraception. They hold to the Consistent Ethic of Life of life. As the late Cardinal Bernardin clearly taught, the consistent ethic means that when we make progress on one front in the defense of human life, all the others benefit as well. It does not mean, however, that everyone has to (or can) do everything. Our MissionThe mission of HLI is to create effective opposition to the culture of death around the world. With 99 satellite offices in 87 countries, Human Life International is the largest international pro-life organization and missionary in the world. To provide hope and care to those facing a pregnancy, planned or unplanned, through Christ-centered ministries. Our mission for the Knights is to support and stand in solidarity with our Priest and Nuns, and our Deacons. We stand as one with the Priest. The Knights of Columbus is a fraternal organization. Blogs4Life focuses on the strategic use of the blogosphere and weblog technology to communicate a Christian pro-life message that will engage the postmodern culture, heal the broken hearted, catalyze change and motivate action. Special emphasis is placed upon blogging activities that reach and impact the local or grassroots level. 40 Days for Life is a focused pro-life campaign with a vision to access God’s power through prayer, fasting, and peaceful vigil to end abortion in America.The mission of the campaign is to bring together the body of Christ in a spirit of unity during a focused 40 day campaign of prayer, fasting, and peaceful activism, with the purpose of repentance, to seek God’s favor to turn hearts and minds from a culture of death to a culture of life, thus bringing an end to abortion in America. Heritage House~Show your Pro-life pride with great merchandise at Heritage House. Pro Life Unity ~means working together to overcome common goals. Many of us know that we have to do all we can to end abortion and actively challenge the culture of death. At Pro-Life Unity, we are forming alliances to do just that. Not all of us agree on the little things, but we agree enough on the big things to know that working together is more productive, serves God and will save lives. Pro-Life Unity was formed in January of 2006 to to help us come together and challenge the culture of death. christianshirts.net believe in the Nicene Creed. We believe that Jesus Christ is 'True God from True God,' Fully God and Fully Man, God Incarnate, and the Second Person of the Holy Trinity. He is not just a good example, a nice person, or a prophet, rather He is God the Son. We believe that there is salvation under no other name except that of Jesus Christ. We believe in the inerrancy (historical and otherwise) of the Bible (when properly understood). We believe in the sanctity of life. As such, we reject abortion without exception and any birth control method that may act as an abortifacient and cause an abortion. We believe that Christianity and abortion are absolutely incompatible. As such, any person who is pro-abortion and claims to be Christian must not have an adequate understanding of the issues. 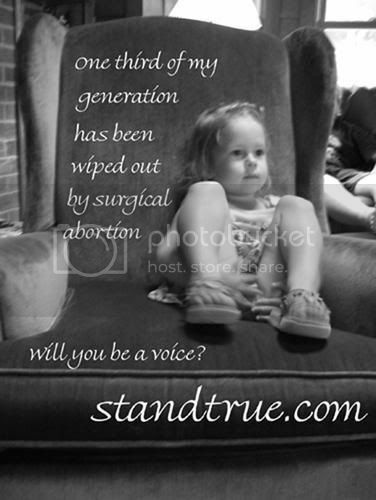 Pro-Life Day of Silent Solidarity Since January 22, 1973 over 50,000,000 babies have had their voices silenced through surgical abortion in this nation alone. Over 4,000 children have their lives taken each day in the name of choice. Over 4,000 women are emotionally damaged every day.On October 20th, people from all over this nation will give up their voices for a day in solidarity for these children. Red arm bands and duct tape will identify them as taking part in the Pro-life Day of Silent Solidarity. They will carry fliers explaining why they are silent and educate others about the plight of the innocent children we are losing every day. Americans United for Life (AUL) is a nonprofit, public-interest law and policy organization whose vision is a nation in which everyone is welcomed in life and protected in law. The first national pro-life organization in America, AUL has been committed to defending human life through vigorous judicial, legislative, and educational efforts state by state since 1971. EWTN~When Eternal Word Television Network (EWTN) was launched on August 15, 1981, many felt there would be little demand for a Catholic network. Now, in its 28th year, EWTN has become the largest religious media network in the world, transmitting programming 24 hours a day to more than 148 million homes in 144 countries and territories on more than 4,800 cable systems, wireless cable, Direct Broadcast Satellite (DBS), low power TV and individual satellite users. In the early 1960s, Mother M. Angelica, a Poor Clare nun, cloistered and dedicated to the perpetual Adoration of the Most Blessed Sacrament, fulfilling a promise made to our Lord, founded Our Lady of Angels Monastery in Irondale, Alabama, in the Deep South. In one of her early evangelizing efforts Mother Angelica began writing "mini-books", short teachings on a variety of religious themes. As the popularity of these "mini-books" grew, her nuns obtained a printing press and started duplicating and distributing them worldwide. Catholic Vote ~Have you ever found yourself criticizing "Washington elites," "media bias" or complaining to friends: "if only the Bishops would do more?" While these gripes may be valid at times, the real question that must be asked is: "what am I doing to change our culture?" We are living during a critical moment in history - a time when people of faith, and the moral beliefs we hold sacred are under attack like never before. Thus some might wonder whether the prayer and work of millions of people can really change our country and the world. If you find yourself skeptical, you need not look far - so were many early Christians! Every day you encounter people, whether at work, at the office or store, (even on Facebook! ), you can make a difference. We must pray, sacrifice, and work without reservation, like never before. And always as a people of hope. Remember, it's contagious. Ask yourself; do I really believe I can make a difference? If your answer is yes, then let's get to work. Students for Life ~The mission of Students for Life of America is to: educate pro-life college students about the issues of abortion, euthanasia, and infanticide; identify pro-life student leaders; equip college pro-lifers with the training, skills and resources to be effective and successful; promote student activity to other local, college and national groups. Stand True ~We exist first and foremost to glorify God. Through the grace of God, we stand for the protection of human life from the moment of fertilization to natural death. Abortion is the act of killing a human person and it is always wrong without exceptions. We are committed to establishing a culture of life, and bringing light to a generation covered by darkness. We believe that the only true way to end abortion is to turn hearts to Christ. Though it is important for the unjust laws to change, we must first turn the hearts of our nation. We are committed to educate, equip and activate young people to stand up and be a voice for their generation. Until the silent cries of innocent children are finally heard, we will raise our voices, shine our lights, we will Stand True.